What a tremendous book Ed Hawkins has given us. In one sense it is depressing – what wouldn’t be when the game which many of us love has been besmirched by the very people who the author met – but this book gives us a far greater knowledge of the ways in which a match can be fixed. I have to say that, as a person who has bet only once - on the 1984 Grand National and “retired” successfully after my 10p stake at 13-1 on Neil Doughty - I have learned a good deal about the cricket underworld through this book. It is not appetising and, sadly, it may not always be possible to trust that what we watch is necessarily what it might or should be. Hawkins must be given great credit for taking on such a story. 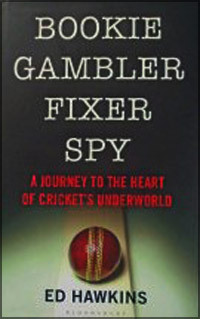 To have become involved with three members of India’s betting underworld is, in itself, courageous. He not only writes very well but explains how easy it is for players to fall prey to these shady characters and, once involved, how a vice-like grip is applied. Hawkins himself mentions how he himself had a casual chat with Ian Bell in Bombay and unearthed apparently inane information that the player would not be playing that day. A side is considered weakened as the news is known before the match, stakes are changed and it is why bookmakers are so keen for prior notice of team selection, pitch conditions and weather. A player should know that he was doing wrong if he agreed to play poorly but does an inane conversation with a possible fan about the weather and the fact that he is not playing that day sow such seeds of doubt? Yes, it does. To those of us who looked on in dismay at the claimed spot-fixing antics of three Pakistanis in 2010, it looked for all the world that no excuse could be found for their conduct and the three and their agent spent time behind bars with their reputation and careers in tatters. It is now that we learn that the illegal Indian betting market does not take bets on when no-balls will be bowled: it is simply too difficult to predict. The Indian system revolves around scoring in brackets ie ten over periods and the lunchtime favourite: the likely winner after the first innings of an ODI or Twenty20 match. The difference is shown that, in England, should a punter go into a betting shop with a request to predict when a no-ball might be bowled, the company would politely decline him smelling a rat. Hawkins feels that, were betting to be made legal in India, it could make a difference. On a lighter note, Ed Hawkins’s description of his visit to India struck a chord with me: he has an astute mind and knowledge of what is going on around him and how people engage him as a westerner and some of the joys of being a white face in India. I enjoyed his description of playing and umpiring on Bombay’s Maidan – a vast green park area set aside for cricket matches – as I myself have participated briefly on Calcutta’s Maidan close to the iconic Eden Gardens. Hawkins has a delicious wit about him in addition to the more taxing and, I am sure, nerve-wracking meetings with some of the underworld which couldn’t have been a pleasant prospect. Cricketers, once ensnared willlingly or otherwise, must be forever in fear of the next request. For those involved in the top echelons of this fraud, murder has taken place. It is a frightening thought which Hawkins describes extremely well. One of the main focuses of the book was the World Cup semi-final of the 2011 World Cup between eventual winners of the tournament, India, and Pakistan. A script given to Hawkins was remarkably close to what happened. Did the Governments of both nations collude after the Bombay massacre at India’s foremost hotel, the Taj Mahal at Apollo Bunder in Bombay, meant that it might have been too much for Indians to take if their cricketers were beaten by their rivals? What did the bookies, fixers and syndicates know? How much could stress be attributed to the performances of players in such a match? ( I, a very interested onlooker, got in such a pre-match state over it that it made me ill enough to have to take the day off work much to the mirth – and, I suspect, disbelief of my colleagues!) Whatever, theories abound and the unappetising thought left is that is what we watch is the best that our heroes serve up? I like to think so but maybe cling to that hope but this terrific book should be one of the most invaluable written on an albeit unsavoury subject.